The floods were caused by the unannounced and sudden opening of the sluice gates of Chembarabakkam lake . The waters were let into the Adyar and Cooum, and then burst their banks. Since the original channels connecting the lakes and rivers had been built over, the waters used the roads as channels, and came down TTK Road (where we live) from the river, entering our house and the Foundation campus. From December 1 to 6 there was no electricity, so we had to ration the water. We have a generator, but no diesel was available as water had entered all the underground tanks in the petrol bunks. Alwarpet was very badly hit. There was knee-high water inside the Foundation – after all, the building is nearly 200 years old , and is at a lower height than the road. Eldams road and Alwarpet junction were under water, and the waters were as high as car windows. Fortunately, I had desilted our well in October, so we could pump clean fresh rainwater. I didn’t dare use Metro water, which was contaminated with sewage water, so I now have sparkling fresh rainwater! Our mobiles had no connectivity. Only the good old BSNL land lines were working, but most people have only mobiles! My 16 dogs were miserable. They hate the rain! Many of our staff – including those who couldn’t reach home and those whose homes were under water – moved in to the Foundation guest house. We were cooking for about 25 people – breakfast, lunch and dinner! Water entered the ground floor of all our homes – mine, Prashanth’s and the old house, which had knee-high water in the beautiful open courtyards and central hall. Many parts of the city were submerged – bridges, roads, buildings and hospitals – while cars and 2 wheelers are still floating around! Boats were the common mode of transport. But those I sympathize with most are the sweeper women. They could not leave their homes, yet the floods destroyed their houses and took away all their belongings (including gold jewellery kept in a safe). The people living in slums are the worst affected. We are the lucky ones. We have never stopped the pooja in the last 200 years. We were forced to do so this time as the priest could not come and water had entered the pooja. The Adyar river entered Chinny’s factory up to a height of 8 feet. The water went into all the machines and computers. The workers from Orissa who live on the premises managed to escape in time and run to the terrace, but they could not salvage anything. The airport closed down, and the trains and buses were all stopped. Our only lifeline was the Bangalore highway, through which relief supplies entered the city. They say 269 people died, but I think the number must be much more (at least 2690). I know entire families of people living beside the river who have disappeared. I saw aeroplane wheels under water! The NDMA (National Disaster Management Authority), Army, Navy and Air Force were magnificent. They rescued people, provided food, etc. The Blue Cross of India was also magnificent. Dawn William was rescuing animals and people by the thousands in pouring rain, night and day. We bought a boat for the Blue Cross, while HSI India sent down two more boats and three vets from Ahmedabad. The boats rescued thousands of people and animals. The state and local government were missing and appeared only on Sunday night. Kanchipuram, Thiruvallur and Cuddalore districts are also badly affected. The electricity boxes are under water – one man was electrocuted on Eldams road. Our problems are a result of corruption and lack of preparedness. While we cannot blame anybody for nature’s fury, we can blame the local government for not cleaning the storm water drains; for not desilting the temple tanks and lakes in summer, when they were dry; for not planting the traditional palm trees and Bermuda grass (arugam pullu / durva) on tank bunds, to prevent water breaching the sides; for not clearing Acacia and Water hyacinth from water bodies; for not clearing the inlets and outlets of water bodies; for not removing constructions and illegal encroachments alongside rivers and lakes in spite of court orders to do so; for dumping solid waste in water bodies, marshlands and waterways; for not closing electric boxes; and so on. Plastic bags MUST be banned, for they had clogged the storm water drains. Four years from now we will have a fresh cylone, floods, etc., and the same thing will happen again. Finally, water was pumped out of our garden and the Foundation campus and power returned on Sunday night and Monday. I hope my next mail is happier, and not something out of the Doomsday Book! If you’d like to donate to help Blue Cross of India with their work rescuing animals affected by the floods. From the U.S. or anywhere outside India, click here. From inside India, click here. As a child, I spent a lot of time around forests where tigers, leopards, elephants and other wildlife crossed my path. Gradually, the forests were cut down, and the wildlife disappeared. Meanwhile, my lovely city Chennai, better known for its temples and temple bells, classical music and dance, became a hotbed of air and water pollution, and garbage. All over the world, the animals and birds I love are now kept in cages and treated as production machines, and exported to live in horrible conditions. Is it ethical? Is it environmentally sustainable? An insatiable greed for wealth and consumption has gripped all people, at the cost of the environment. This has led to the crisis of global warming and climate change. Mr. Selvapandian, CPREEC officer; Dr. Nanditha Krishna, Director of CPREEC, visiting Nenmeli, one of the sacred groves restored by CPREEC. Each one of us must make an individual commitment to live sustainably and change one’s own lifestyle. Mahatma Gandhi said “Earth provides enough to satisfy every man’s need but not every man’s greed,” and “Be the change that you wish to see in the world.” These are two excellent dicta that can save the world. Dr. Nanditha Krishna, outside the C.P. Ramaswami Aiyar Foundation and CPREEC (the C.P.R. Centre for Envronmental Education). Top photo: French President Francois Hollande, Dr. Nanditha Krishna, at the Summit of Conscience, Paris, July 21, 2015. Second photo: Mr. Selvapandian, CPREEC officer, Dr. Nanditha Krishna, Director of the C.P.R. Centre for Environmental Education, at one of the 52 sacred groves, Nenmeli, restored by CPREEC. Third photo: Dr. Nanditha Krishna, outside the C.P. Ramaswami Aiyar Foundation and CPREEC. As December 21, 2012 approaches, there are a few who await the end of the world, and many more who dismiss such thoughts as being silly, and others who just hope that nothing unexpected or out of the ordinary happens. Is the end of the world such a bad thing? And what would it mean? Certainly, massive cataclysms and terrible destruction would cause immense suffering to people, to animals, and to the earth. Suffering on any scale is a bad thing, and whether or not any good comes out of it, we all seek to avoid it. There have been cataclysms both recently and in the past, and one can only suppose that there may be more to come – with or without an end to the world. Perhaps there will be an intensity of disasters, we have no way to know. But what if the end of the world also has another meaning? As we all realize, we live in a world that, at the very least, has many flaws, and at the worst, is a realm of extreme suffering for many beings. What if the world and all of history, as far as we know it, is like a vast carpet being unrolled and stretched out? Now we have come to the end of the unrolling, and it is time for it to be rolled back up again – to go back to the beginning? All the myths of the world tell of ages in the far, remote recesses of time, that were not mundane and prosaic, but that instead were magical, that sparkled with life and positivity. Of course, being “rational, modern people,” we dismiss these myths as being pre-scientific, irrational, and based on superstition. The truth is though, only some of us dismiss these myths as mythical. There are those among us who, though we may not always say so publicly, hold a radically different view. Some of us, though we may not openly acknowledge it, do believe in magic, in miracles, in the mystical, in the visions and dreams of ages long past when the world was not boring, not prosaic, not humdrum, not filled with conflict and degradation – not, in fact, increasingly cruel and distasteful. What if this great carpet, when it has rolled out to its end, simply begins to roll back up again? For example, what if, instead of disappearing from the face of the earth, all the great forests begin to grow back? I understand that the damage has already been done and that it is very severe and irreparable, in any normal, sensible way of seeing things. We are so used to a world in which human beings are winning the war against nature, where the trees and the plants have no defences at all against the inexorable march of “progress,” though how it can be called “progress” is a great mystery. How can a world of steel and concrete be “better” in some way than a world of forests? But what if, by some magic stroke of a great wand, humans were simply no longer able to wreak destruction on the natural world – no longer able to cut down trees or to replace magnificent, ancient forests with shopping malls, parking lots, and garbage dumps? What if the Amazon filled up again with trees? And all the forests of North America came back? And all the forests of Europe and Asia too? Or what if humans no longer had the capacity to pollute the oceans and destroy the lives of the fish, the whales, and the sea creatures? It would take a while of course for all the pollution that’s already happened to deteriorate and stop causing death and destruction in the oceans, but perhaps some kinds of bacteria and enzymes would evolve to eat up all the plastic junk and horrible toxic substances. Then the sea creatures could live in peace and freedom again and swim in clear waters among the graceful plants of the seas. What if all the farm animals; the cows, the chickens, the geese and ducks, the turkeys, the pigs, and the lambs were never killed for dinner? What if instead they roamed the hills, among the great trees, or swam in blue lakes? There are a few logistical problems, unfortunately, because modern farm animals are no longer adapted, as their ancestors once were, to living in the wild. So there is not a simple, easily seen solution as to how and where they could live. But the point is not that we have all the answers, which certainly we don’t. The point is simply that the way farm animals live currently, mostly on factory farms, is profoundly cruel and that the world should not subject all these billions of innocent animals to such an unkind fate. A different world is needed – not one that is just a tiny bit better – but a different one altogether – a different situation – one in which the human-ruled world as we have known it, has come to its end, and there is a new world filled with magical animals that fly on the wind and graze on green hillsides – perhaps with dragons too, breathing fire. An end of persecution is required – an ending of the persecution of all of nature, all animals, and the earth – and along with that end — assuming there are still some people living on the earth — the ending also of the persecution of tribal peoples, of the extinction of their languages and their culture, and ending of the persecution of all those who suffer at the hands of those who seek to subjugate the earth – the ending of wars, of economic injustice, of the persecution of women, of the young, of the old, and the disabled. An entirely different world is needed, not an improvement of this world, not a updated model of the same thing, but instead a world where the sacred and the spiritual are alive, well, and recognized – a world that is in touch once again with the cosmos – with God and the Gods, with magic, with life and inspiration, with innocence, a world which has broken free of the bonds of slavery and the constraints of the gray misery that this current time has descended into. Perhaps this may be what is meant by the ending of this cycle and the birth of another – the great rolling back up of the cosmic carpet, back to the beginning. Despite all apparent evidence to the contrary, we do sometimes have a sense that the rule of tyranny and hatred, which seems so well established, will not endure forever – that, instead, the destruction of all that is innocent and sacred, will be brought to an end, perhaps sooner than we could imagine – and that there are transformative powers, immense currents, and great winds afoot in the cosmos that we cannot see or know, but that are there, all the same, and very real. Top photo: Author: Wolfgang Sauber / Wikimedia Commons /http://en.wikipedia.org/wiki/File:Maya-Maske.jpg / National Museum of Anthropology in Mexico City. Maya mask. Stucco frieze from Placeres, Campeche. Climate change is one thing when it is an abstract discussion about how high the sea will rise in around a hundred years when we are no longer here – or when we feel sad watching the poor polar bears in distress, but the polar bears do live quite a long way away – climate change is quite a different, much more menacing threat when it effects New York City, filling part of the subway system, used every day by five million people, with saltwater that poured in from the sea for the first time in 108 years. During the huge storm, Sandy, much of the hardest-hit state, New Jersey, was underwater. Storm-caused fires destroyed 110 homes on Long Island. Suddenly, climate change is no longer some sort of ghost lurking on the edges of reality, it has appeared, and is a real presence, with a concrete form. There is little that is more frightening than the threat of a basic change in the earth’s climate. Terrorism, economic hardship, and political instability can come and go, but the climate is something much more fundamental, and we can only survive on a planet that remains conducive to life. TV footage of the many feet of water flooding the tracks, the deserted platforms, and the tunnels of the New York subway has a macabre feeling, like some long-dead civilization, rediscovered by a perplexed explorer of the future. As humans, we have destroyed so much of the earth that now, it is not only the forests, the wild animals, and the oceans that are suffering – but our destructiveness has come back to haunt us, and it is we ourselves who now endure the consequences of the harm we have caused. There have been great upheavals in the past – and even more in the far distant past – the past that is revealed to us only in mythology, a past so distant that it lies beyond what we call the beginning of history. A past so far back that it can readily be disregarded by anyone who wishes not to see it. Yet, it is intriguing, for example, that legends of the Great Flood exist in so many different cultures on earth. There is geological evidence too that supports the occurrence of this flood. There have been ages that have come and gone, long, long before this present age. Only in our moments of greatest blindness do we assume that what we call “history” is the only history that has existed. There were worlds before ours, and there will be worlds to come. These past worlds leave memories in the traditions and mythologies of the world, none more vivid or more evocative than in the traditions of India. 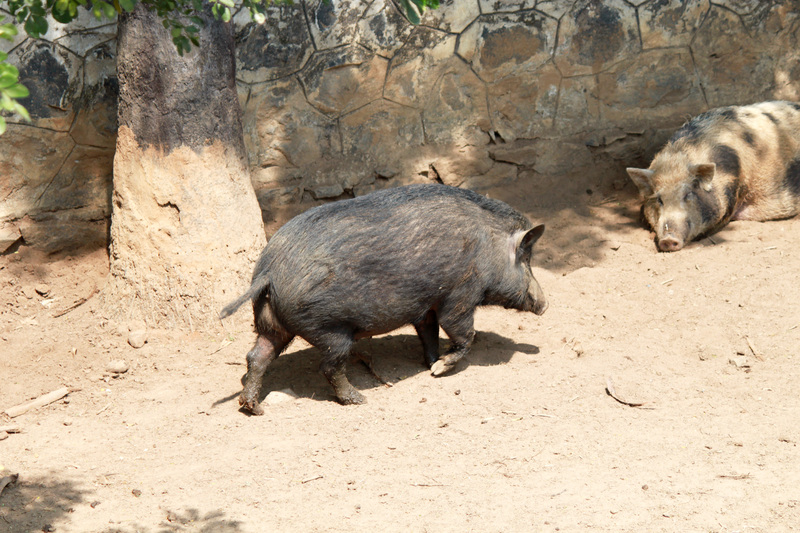 Dr. Nanditha Krishna, in her book, Sacred Animals of India, tells one of the stories of Varaha, the boar, who was the third incarnation of Vishnu. Originally, the universe was entirely water, and the earth, who was the wife of Varaha, was very tiny, just the size of a human hand, lost in the water. Brahma, God the Creator, became a black boar named Emusha, who had one hundred arms. Then Emusha rescued his wife, the earth, by lifting her with his tusks out of the water. Ultimately, Vishnu and Brahma are both aspects of God, so it needn’t be confusing that they seem interchangeable, and that the earth is the wife of both. In another version of the story, Hiranyaksha, a demon, wanted to control the earth, so he rolled her up in a mat and threw her into the ocean. When she was thrown into the water, she let out such a loud cry, that it was heard all the way up in heaven, where Vishnu lives. Hearing her cry, Vishnu became the giant boar, Varaha, in order to rescue the earth. A battle ensued that lasted a thousand years, and finally, the victorious Varaha lifted the earth on his tusks from down in the depths of the sea, and placed her gently on top of the water, where she rests today. To imagine the earth drowning in the water is not so entirely different from the story of the great flood, although there is also in India a more specific story of the Great Flood, the legend of Manu and Matsya. 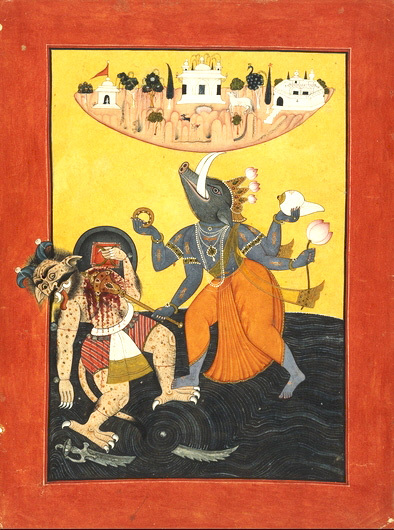 Worlds tend to end in fire or floods, and for the earth to be cast into the water and then to be saved by Varaha, the incarnation of Vishnu, may be seen as portraying the end of one age and the beginning of another. As the waters close over the earth, she is not completely abandoned though, because her divine husband arrives to save her, and life begins anew. Whatever the future may bring and however long our current age may last, the point of considering a more cosmic perspective is not in any way to diminish the reality of human-caused climate change (or to look at it one way, perhaps it is we who sometimes act like the demon, Hiranyaksha, carelessly casting the earth into the rising seas). Anyway, a look at a very ancient view, told in the mythical stories of India, may give one a more detached overview – a glimpse that transcends the level of our human predicament. 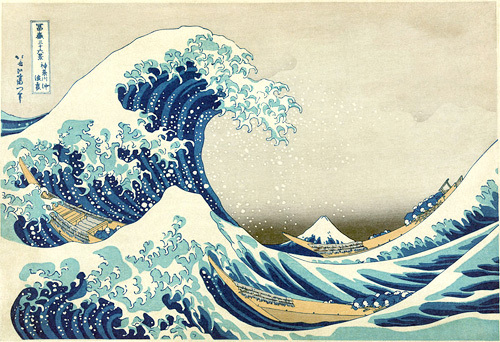 Top image: Artist: Katsushika Hokusai (1760-1849) / Color woodblock print / Wikimedia commons / Public Domain / The Great Wave off Kanagawa.